Chapter 6 is about the Brazilian Bolsa Familia , the largest conditional cash transfer program in the world. Bolsa Familia currently reaches 14 million families, including 17 million students. It has been one of the main contributors to the stark reduction of extreme poverty and to the elimination of hunger in Brazil over recent years. 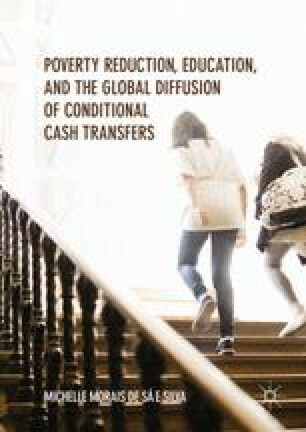 The chapter gives an account of how the program was created, how it currently works, and how it relates to education policies and practices in Brazil. The chapter also raises questions about the program’s political survival, given the recent and abrupt changes in Brazil’s political system. Brazil. (1996). National Educational Bases and Guidelines Law. Retrieved February 24, 2010, from http://www.planalto.gov.br/ccivil_03/Leis/L9394.htm. Escola Nacional de Administração Pública. (2010). Concurso inovação na gestão pública federal: Resumo das iniciativas ordenadas pelo número de inscrição (Award Innovation in Federal Public Management: Summary of initiatives by registration number). Retrieved March 01, 2010, from http://inovacao.enap.gov.br/images/Documentos/resumos.pdf. IDB. (2010). BR-T1080: Knowledge agenda—Social protection. Retrieved March 8, 2010, from http://www.iadb.org/projects/project.cfm?id=BR-T1080&lang=en. IPC-IG. (2010). Africa-Brazil Cooperation Programme on Social Development. Retrieved March 5, 2010, from http://www.ipc-undp.org/ipc/africa-brazil.jsp. MDS. (2010a). Índice de Gestão Descentralizada (Index of Decentralized Management). Retrieved March 2, 2010, from http://www.mds.gov.br/bolsafamilia/estados_e_municipios/estados_e_municipios/indice-de-gestao-descentralizada-igd. MDS. (2010b). Municípios receberão R$ 22.5 milhões para investir na gestão do Bolsa Família (Municipalities will receive 22.5 million reais to invest in the management of Bolsa Família). Retrieved March 2010, from http://www.mds.gov.br/bolsafamilia/noticias/municipios-receberao-r-22-5-milhoes-para-investir-na-gestao-do-bolsa-familia. MDS. (2010c). Descumprimento de condicionalidades (Failure to comply with conditionalities). Retrieved March 3, 2010, from http://www.mds.gov.br/bolsafamilia/condicionalidades/advertencias-e-sancoes. MDSA. (2016a). Bolsa Família: acompanhamento da frequência escolar alcança 91.8% dos beneficiários. Retrieved November 19, 2016, from http://mds.gov.br/area-de-imprensa/noticias/2016/novembro/bolsa-familia-acompanhamento-da-frequencia-escolar-alcanca-91-8-dos-beneficiarios. MDSA. (2016b). Pente-fino no Bolsa Família encontra irregularidades em 1,1milhão de benefícios. Retrieved November 19, 2016, from http://mds.gov.br/area-de-imprensa/noticias/2016/novembro/pente-fino-no-bolsa-familia-encontra-irregularidades-em-1-1-milhao-de-beneficios. Missão Criança. (2010). Atuação internacional (International action). Retrieved on March 5, 2010, from http://www.missaocrianca.org.br/saibamais.html. World Bank. (2004). Project Information Document. Bolsa Familia First Adaptable Program Loan. Retrieved March 8, 2010, from http://www-wds.worldbank.org/external/default/WDSContentServer/WDSP/IB/2004/05/11/000104615_20040513125107/Rendered/PDF/BF0PID0100MAY02004.pdf. World Bank. (2010). Key development data and statistics. Retrieved February 19, 2010, from http://web.worldbank.org/WBSITE/EXTERNAL/DATASTATISTICS/0,,contentMDK:20535285~menuPK:1192694~pagePK:64133150~piPK:64133175~theSitePK:239419,00.html.